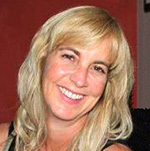 Andrea L. Garrett is a native of Southern California. Art has always been an important part of her life, inspired by creative energy since she was a child. Andrea’s family encouraged her interest in art from an early age. She began entering exhibitions and competitions when she was 10 years old, and won numerous awards at county fairs and local exhibitions. As an adult art gave way to motherhood, and raising her 3 children became the priority for more than 20 years. With the kids grown and on their own, Andrea returned to California State University Los Angeles to finish her degree. In 2014 she earned her BA in Studio Art with Honors. She now focuses on art full time with a renewed passion and commitment. My relationship with art has been a profound journey my whole life. I made a conscious decision to become an artist later in my life. For me, this decision meant approaching my world in a more thoughtful manner, taking note of things I had previously taken for granted. It became very important to me to develop a keen awareness of the little things around me. Taking in as much detail possible, rediscovering color, light, and shape with a more focused eye. For this reason my work is inspired by my experiences and my environment and features nature, animals, and people. My style is realism, and my preferred medium is oil as it allows me to linger in the process, infusing each painting with its own life. The uncomplicated beauty of ordinary things around me speaks to my soul and invites me to enter their simple existence one brush stroke at a time.